CoverGrip Painters Drop Cloth is safer than a traditional canvas drop cloth because it stays in place - no more slipping or sliding. 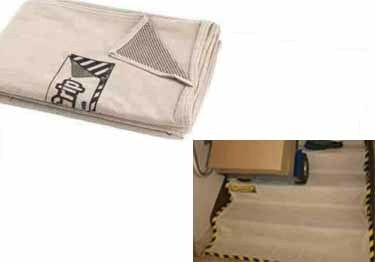 CoverGrip Painters Drop Cloth has a specially designed backing made of PVC rubberized dots that hold tight to the surface and prevent the drop cloth from moving or bunching up. Hi, can you tell me if it�s waterproof? I can�t tell if the rubber back is just dots or a coating. And this is 4 sheets, for what total sq ft? Thanks! CoverGrip™ Painters Drop Cloth is safer than a traditional canvas drop cloth because it stays in place - no more slipping or sliding. CoverGrip™ Painters Drop Cloth has a specially designed backing made of PVC rubberized dots that hold tight to the surface and prevent the drop cloth from moving or bunching up. Plastic Shoe Covers protect floors from dirty wet shoes or work boots. Slip resistant booties available in 3 mil or 9 mil design. Ideal for medium traffic areas. Exceptional combination of eco-friendliness & functionality in a mat perfect for use in & out. Move appliances, equipment, & furniture while protecting hardwood, ceramic, vinyl, or any hard surface from scratches and marks.